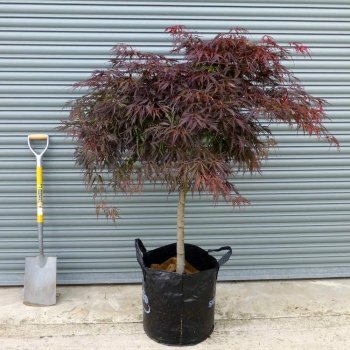 Crimson Princess is a lovely Japanese Acer tree with an upright form and arching, slightly weeping branches. This Japanese Maple has lace-like, dissected leaves that display a deep red colour in spring, followed by bronze/purple hues in summer and fiery scarlet tones in autumn. This is a wonderful addition to any border or patio where the colour changes will be appreciated. The height and spread of the Crimson Princess will only ever reach about 2.5 x 2.5 metres in 20 years (often remaining slightly smaller), making it ideal for gardens with limited space. Similar to all Acer trees, Acer Palmatum dissectum Crimson Princess prefers moist but well-drained acid to neutral soil. We have this variety as a mature specimen tree, measuring 150 - 175cm in height, top grafted on a stem of 130cm in a 50L container. Pot grown Crimson Princess Japanese Maples can be planted at any time of the year. Firstly, remove all weeds and grass within a metre of your desired planting hole then dig a square hole as deep as your root mass and approximately 2x as wide. To help your tree establish more effectively, we advise sprinkling root grow in the hole, especially if you have poor soil. If you’re planting Japanese Maples in spring or summer, water well and regularly for the first few months. If you’re planting in autumn, you may only need to water your tree a little. Keep an eye on newly planted trees and increase watering if there are extended periods of hot or dry weather. If possible, use rain water instead of tap water as this is more acidic and better for foliage colour in Japanese Maples. We stock a range of irrigation kits for more effective watering.